I was a band guy back in school. I started playing the clarinet in 6th grade, after a little bit of pushing by my professional musician grandfather. It took awhile to realize that the clarinet wasn't "cool", but I did find out that I had a knack for music. Once I got into high school, I started playing alto saxophone, too, and found myself playing in several of the bands at school: Marching Band, Symphonic Band, and Jazz Band. It was in the Jazz Band that I had the most of fun. 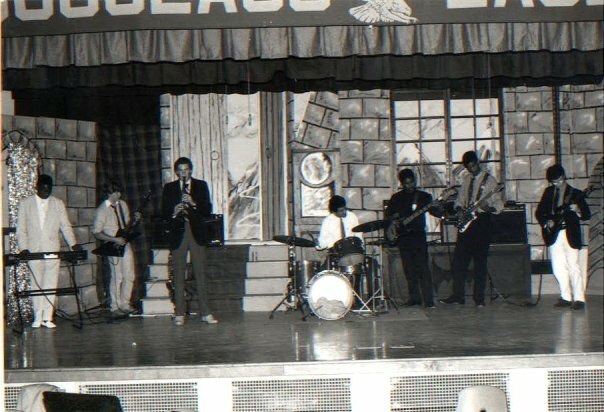 Our band included Joe on guitar, Giles on guitar, Kirk on guitar, Randy on bass guitar, Dominic on drums, Andre on trumpet & keyboards, Wakene on sax, and myself on sax and clarinet. Our band director, Mr. Lopez, played drums, as well. We were quite a diverse group. Joe & Dominic were into heavy metal music. Kirk, my best friend in the band, was into traditional jazz. I liked big band jazz. Andre and Giles liked R&B. Mr. Lopez played in a jazz trio. Half the band was Black, half was White, and Mr. Lopez was Hispanic. We were a pretty diverse group. But we had a lot of fun. Most of us had never performed in front of an audience. That was a new experience. Because of the make up of the band, we had a nice mix of instrumentation, which meant all of us (other than the guitars) could be looked at to take solos, which also was something new for many of us. I remember, while trying to come up with a name for our band (which we never did do), my uncle suggested No Experience Necessary, which I still think was apt. We were all out of our comfort zone, but eager to we a real band. It was rough going at first, since we all had different tastes in music, but, amazingly, we started to sound pretty good. Unfortunately for Dominic, he was completely brand new to playing the drums, and that became difficult for the rest of us. We just didn't have the time of patience to wait for him to learn on the job. He played several shows with us, but it soon became apparent that it wasn't fair to the rest of us. This meant that Mr. Lopez ended up playing drums with us. He was a professional, so it gave us a nice, solid foundation. Randy, despite playing almost all year missing at least one of his bass strings, but a decent bass player, and so our rhythm section was pretty good. Joe and Giles weren't great guitar players, but they could play the necessary chords mostly at the right time. Kirk was a real talent, though, and of everyone in the band, he was the one we could actually call a star. His personality didn't fit the role, but his playing was excellent. He just had so much talent, and, really, he could play just about any instrument and play it well. Andre wasn't a particularly great trumpet player, but he was decent on the keyboards. Wakene was new to the sax, but he played without any fear, and he enjoyed himself more than anyone else. Then there was me. Aside from Kirk, I probably was the most experienced musician in the band, but I was still new to the sax. My introverted nature kept me from the spotlight, too, and I had no desire to take solos. I had no problem playing anything else, though. Mr. Lopez originally had us playing from sheet music, but as the year went along, we started playing more and more original music. It truly was a collaborative effort, too. We all contributed to the music we played, and I think that made us unique. Previous versions of jazz bands at the school, though much more solid, played very little original music. Early on, Randy played a lick (bass line) from a song he heard one night late on the radio. He didn't know what it was called. Well, we took it and made it into a song we called "New Groove". It turned into a bit of a mish-mash, but it was truly original, and something we could call our own. But the first time we performed "New Groove" in front of an audience, with Dominic on drums, we got off-track and some of us were on the beat, and some of us were off a beat, and the whole thing almost fell apart before coming together at the end. The audience, mostly made up of parents and classmates, didn't know what to make of what they just heard, and we knew we had totally messed it up, but we got a nice ovation. But we could do that. We might start with just a small piece of something one of us heard, and we would build on it, layer it, develop it, and play the snot out of it until it sounded cool to us. Then we'd perform it live in front of an audience and we always got great feedback. It was pretty awesome. About halfway through the year, we had a pretty developed repertoire, and we were performing a show about once a month. It was about this time that Kirk had been playing around with some pretty unusual scales and chords, and that led the way to a guitar melody he developed and shared with us. As usual, we started playing around with it and it became the basis of a pretty cool song. We called it "Arabian Sunset". For something really different, I played my clarinet instead of the sax, and tried to get an English Horn sound. It certainly was unusual. But it also led me to having to play my first solo, and I was a nervous wreck. When we finally performed it, I actually did better than I thought I would, and it filled me with confidence. The song itself, with Kirk's unusual melody, and spectacular guitar solos, made it a hit, at least to us and our invested audience. Having Mr. Lopez playing drums made it pretty solid, too. The clarinet actually worked on this song, though it hindsight, I'm not sure it was the best choice. Anyway, we really had a blast, and it made us "mini-celebrities" at school. Kirk and I continued to play together after high school for a few years, but eventually there just wasn't time for us to get together, which is a shame. But, now I'm trying to get my daughter interested in band and she is actually showing interest in the clarinet. I'm looking forward to seeing if this goes anywhere. Anyway, band is pretty cool.